Two Tasmanian Devils at their at Devil Ark in New South Wales' Barrington Tops. A group of Tasmanian devils will be transferred to a small Australian island to start what is hoped will be a self-sustaining population, free from the facial tumour that has devastated their species. A group of Tasmanian devils will be transferred to a small Australian island to start what is hoped will be a self-sustaining population, free from the facial tumour that has devastated their species. Tasmania's Environment Minister Brian Wightman said 14 of the marsupials, carefully selected from captive breeding programmes across Australia, would be released Thursday on Maria Island, a nature sanctuary off the state's east coast. He said it was a "major step forward" in the race against extinction of the devil due to an extremely contagious facial tumour that has decimated the once-rampant rat-like marsupial. Their plight is so dire authorities have started breeding a so-called "insurance population" in captivity to ensure they do not die out. 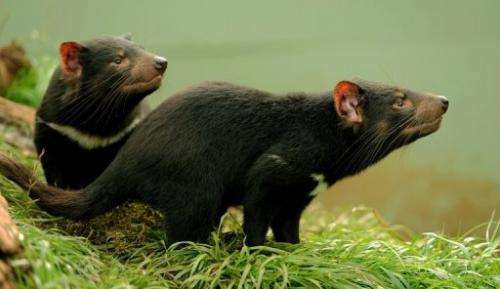 "The Maria Island translocation is designed to establish a self-sustaining population of healthy wild devils in a safe haven where they are protected from interaction with the deadly facial tumour disease," Wightman said. Graphic on Australia's Tasmanian Devils, rare carnivorous marsupials in a battle for survival against a contagious facial cancer. "It will strengthen the insurance population of disease-free Tasmanian devils, help preserve wild traits in the insurance population and provide genetic stock for future reintroductions." Tasmania is the only place where the devil is found in the wild and since the facial tumour was first discovered in 1996 numbers have plunged by 91 percent to the low tens of thousands. There are few disease-free pockets remaining on the island state. The cancer, which typically causes death within three to six months, is spread during fighting over food and territory, when a healthy devil will bite an infected devil's face and pick up cancer cells. Maria Island, a rugged national park that can only be reached by boat or plane and is vehicle and shop-free, has never before been a devil habitat so Wightman said there was "no known risk of the facial tumour disease". National Environment Minister Tony Burke said the transfer was a method of "last resort and it has to be done carefully with good scientific oversight", with all animals to be carefully screened before release. Experts had deemed the devils unlikely to impact other native species on the island and the ecosystem would be monitored carefully, he added. If successful authorities plan to increase the overall population on Maria Island over the next two years to about 50 animals.